When I was in grade school, we had to sell magazines as a fundraiser for our school. I hated selling stuff! I wasn’t a great salesperson, and my mother took pity on me and ordered a magazine called “Early American Life”. That magazine changed my life for good and for the better. When my mother got the first issue, she threw it in the garbage, declaring it “not what she thought it would be” and wasn’t interested in “house decorating magazines” and thought it didn’t teach enough about life during Colonial times. When she wasn’t looking, I snatched the magazine out of the garbage, took it to my playhouse and was transformed to a world far different from mine: no crummy, run down shacks with icky beat up furniture, houses were clean and there was room for everyone. I vowed one day I would have my own historic home to restore. I ended up with two. Mom’s subscription ran out and my Grandmother picked it up for me for a while. I still have most of those magazines, too, and when I moved out on my own I re-read them, dreaming of my own home in the cute apartment I rented. One day while I was out grocery shopping, I spied the latest issue of the magazine and instantly bought it. After a while, I became a subscriber and I relish every story in every issue. One of the stories published a few years back was about penny rugs; how thrifty Colonial housewives used scraps of nothing and transformed them into beautiful hand stitched works of art. One designer had a website and I was smitten with her work. 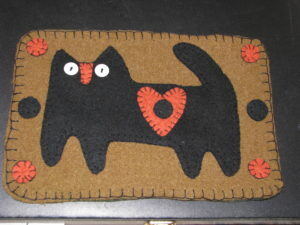 I bought a black cat heart penny rug from her and in 2014 I stitched it together with a lot of tears. I had lost my beautiful, beloved cat Shorty earlier that year and the cat reminded me so much of her, with the big round button eyes and was a little plump, and Shorty was my “little plump of love”.